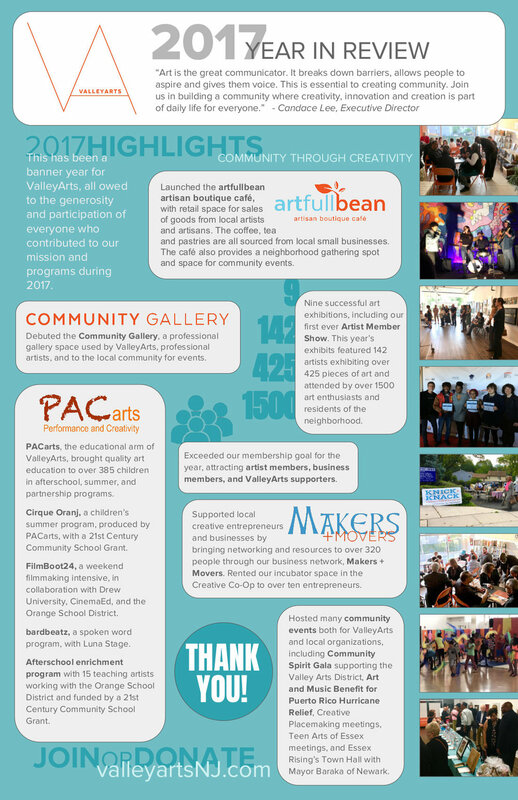 This has been a banner year for ValleyArts, all owed to the generosity and participation of everyone who contributed to our mission and programs during 2017. Thank you for your support throughout the year - without all of you, this wouldn't be possible. We look forward to working together for another successful year inspiring creativity and vitality through the arts, serving creative entrepreneurs, and encouraging everyone to participate in the arts, culture, and creativity as a part of everyday life. Your continued support will help us continue our work and programs focused on community through creativity in the coming year. Right now is the perfect time to join, renew, or send a donation. ValleyArts is a tax exempt organization under Internal Revenue Code 501 (C) 3. Your contribution is tax deductible. Just go to our website or send your donations to ValleyArts, 400 South Jefferson #10, Orange, NJ 07050. Credit cards accepted by phone or on site. Wishing you a peaceful and joyful holiday season full of friends, family, and art!